Ok. Fine, be careful when you’re eating pre-packaged food that contain wheat flour or you could land yourself in the emergency room. Yesterday, March 17, 2019, was supposed to be a typical Sunday back at home in Davao City. I was set to visit my lovely ladies from my small group in church for a christening and then spend the remainder of the afternoon hanging out and catching up with life. I’ve been gone for almost half a year and was terribly too busy to even catch up with the people I’m supposed to keep close in my life. So ideally this Sunday was supposed to be the start of the catching-up-with-people-who-matter week. A note of caution, I’m writing this narrative in recovery mode. 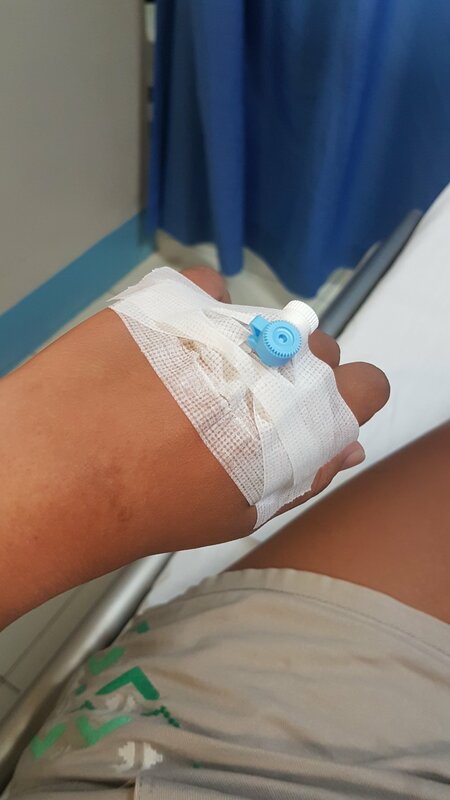 At the time of writing this, it’s barely been 24 hours since I was rushed to the emergency room (ER) so please bear with me—the drugs are really potent. My first time in the ER and at least my lashes were perfect. Too bad the rest of the world didn’t get to see these curled-to-perfection lashes. I ate two pancakes that my Mom made. In the perfect world, this shouldn’t have been a problem. We’ve been eating that brand of pancakes since I could remember and I am a strong, healthy woman—rarely do I get sick and I’ve never gotten admitted to the hospital. I have no known allergies too! Ten minutes after ingesting the pancakes, I felt my throat itch and become constricted. I thought I was going to get sick with the flu or cough because it felt like that. Afterward, I couldn’t breathe properly at this point, I was already in an outdoor ceremony waiting for the baptism to start. I felt unlike myself. I felt tired and wanting to lie down, but since I haven’t met these girls (Kwin, Mara, Isabel, and Eyh) in the longest time, I didn’t want to leave. My mind also kept thinking of the lunch feast that was supposed to happen at Kwin’s house after the ceremony. Seriously, who doesn’t love food? I was sure that I could stay longer. I messaged my brother that I didn’t feel well and if I couldn’t handle it anymore, he should come to pick me up. I remembered to message my best friend who already is a licensed medical doctor about what I was experiencing. She’s the best, really! Never failed in giving me the right instructions and meds to pop. These are the times that I’m so grateful for her and for God allowing her to become the doctor that she dreamed of becoming. Unfortunately, the oral medicines didn’t do much good as the allergic reaction I was experiencing was severe. Anaphylactic shock or anaphylaxis is a severe, life-threatening allergic reaction to something. In my case, the only thing I ate was pancakes from a ready-mix that my mom prepared at home. It was freshly opened and supposed to be safe. Googling this post-ER, my friend Claudine shared this article about the “pancake syndrome” and it was an exact match to what I experienced. Note that my mom prepared pancakes like she always used to and it was a fresh batch of newly opened pancake flour. My brother finally arrived, and when I got in the car, to my surprise he also said he was experiencing the same symptoms that I had! Our airways felt narrower, breathing was slowed and short—I couldn’t breathe properly and felt like I had an asthma attack (where I only had one ever in my life). Literally felt like drowning on land! We rushed home and another plot twist in the story, my cousin, who also ate some pancakes, was also experiencing the same allergic reaction! I had it worst, I don’t know why but it was decided then that we all needed a trip to the emergency room as Anjel advised over the phone. I knew I needed quick relief. I saw my hands turn lobster red and rashes started appearing on my skin, particularly my arms and my face felt too puffy. I’ve never had my face so inflamed in my whole life! Changing into more comfortable clothes, we headed to the nearest hospital. It was a good thing I was home, and my parents were in town. My mom accompanied me, my brother and my cousin to the ER, it was painful to see how some of the hospital staff were unsympathetic to our plight. I guess if they see we could still walk, we were okay? Anyway, I was already irritable because everything was not feeling good. I was still having a hard time breathing, it was itchy everywhere, and I felt like the skin on my face was exploding. We were then ushered to the ER beds, and finally, the good doctors arrived. The thought of the injection hurt more than the actual thing. So amazed at this first in my life that I just had to take a photo. They did the standard procedure and advised injections (I can’t remember what it was, but it was two shots) for the itch to go away and one probably an antihistamine? I can’t remember anymore, but it was perhaps epinephrine or something similar. I declined being admitted because I didn’t think it was necessary, but I agreed to have the injections done immediately. I was warned that one of the drugs would make me dizzy and it sure did. To amuse myself, I kept taking photos to remember this moment because it was my first time to visit the ER. The drugs worked immediately! It was administered directly to the veins, and the effect was instantaneous! I felt really high and dizzy. I actually enjoyed a little of myself being drugged but disliked it after realizing I couldn’t type on my phone anymore. Since sleep wasn’t always afforded at this stage of my life due to work, I welcomed the opportunity to doze off. The drugs really helped relieve everything and maybe after almost an hour (I lost track of time), I felt normal again. We were discharged from the ER, and I was famished. We were told to stick to a hypoallergenic diet which meant vegan food minus nuts. Glad that I enjoyed vegan food, it wasn’t a big transition for me, but my brother who hated being prohibited from eating whatever he liked was having a difficult time choosing what to eat. We went home, and I slept the whole afternoon and evening, probably just waking up at 8:30 pm to drink the meds that were prescribed and checked my phone to update the people who cared about me that I was fine and recovering. This is probably the worst writing I’ve ever published in my whole life, but I wanted to get this story out, so I don’t have to keep repeating myself. Also, I promised myself to publish more often—so here’s the vulnerable side of what I write and I’m sharing it to you. To my family, friends, colleagues, and co-workers that are now family—thank you for caring! It wasn’t a lengthy ordeal, but it was an ordeal nonetheless. To all those who gave me well-wishes, prayed for me, messaged me directly to tell me all the good things in life, THANK YOU. You know who you are and I’m grateful to have you in my life. From my saltwater heart, thank you so much! Daghang salamat! Terimakasih! Maraming salamat! What happened was a great reminder of what and who truly matters in this life—the only life we get to live. I’m still all sorts of bits and pieces from what happened, but I am glad to be alive and happy to have things normalized faster than I expected. I hope to be fully recovered sooner, able to work productively and hit the beach really soon because the waves wait for no one!